Worryingly, while interviewed by the Christian Broadcasting Network, the US Secretary of State Mike Pompeo, who serves as a deacon at his local evangelical church, agreed that his boss was sent by God to save Israel from the Iranian menace. “As a Christian I believe that is possible,” he said. “I am confident the Lord is at work here.” What happened to separation of religion and state? Combined with his anointing of a new Venezuelan president at pain of severe economic sanctions or, worse, military action, Trump evidently sees himself as our planet’s ruler happy to violate international law, the Geneva Conventions as well as decisions taken by the UN Security Council [UNSC]. This dictatorial behaviour with echoes of the Ottoman Empire should make every sovereign nation shudder. Where next I wonder? It’s no secret that Israel’s far right is pushing for a Palestinian-Jordanian confederation and/or the establishment of a Palestinian state on the northern Sinai Peninsula, ideas that are bitterly opposed by Amman and Cairo. Countries rich with natural resources such as oil, gas and gold are natural targets if the past is any predictor of the future. Saddam Hussain destroyed his WMD [weapons of mass destruction] in the aftermath of the 1991 Gulf War. Libyan leader Muammar Gaddafi agreed to eliminate his nuclear programme in 2003. Kim Jong-un may be a tyrant of the nastiest variety, but If I were in his shoes I wouldn’t be in a hurry to dismantle my nuclear defence capability on a Trumpian handshake. International outrage over the Golan has been muted. The Arab League has characterised US recognition of the Golan Heights as illegal. The EU has rejected Israeli sovereignty. The 22,000 Druze who live on the slopes say they will always be Syrian; very few have accepted proffered Israeli nationality. Objections have been duly registered, but then what? CNN’s Oren Liebermann falsely claims that 1,500 square kilometres of the Golan, occupied by Israel during the Six-Day War and annexed in 1981 is “disputed territory”. There are no grounds for dispute other than those with the tanks have ‘right’ on their side. Arabs have populated the Golan since the second century BC. During the Ottoman era the territory was controlled by Damascus and in 1946 it was recognised as part of the Syrian Arab Republic. Israel’s arguments are purely security-centric. UNSC Resolution 242 prohibits acquisition of territory by war. Subsequent resolutions have reconfirmed Syria’s sovereignty. On Friday, members of the UNHRC, among them all EU member states, voted 26-16 condemning Trump’s recognition of the Golan’s annexation. Frankly, Russia’s annexation of Crimea, although equally illegal, pales in comparison. The territory was part of the Russian Empire until it was subsumed into the Soviet Federation. It was transferred to Ukraine before the break-up of the Soviet Union. Furthermore, the mainly Russian-speaking population overwhelmingly voted to join Russia in a referendum. Yet the international community has showed its displeasure with crippling sanctions. Will Israel and its backer the United States receive similar treatment? I know, silly question. The Israeli media is spinning the result to show how more states than ever are supportive of Israel’s claim. Are they really or are they fearful of incurring the Trump administration’s wrath or being accused of anti-Semitism at a time when criticism of Israel is being branded anti-Semitic? 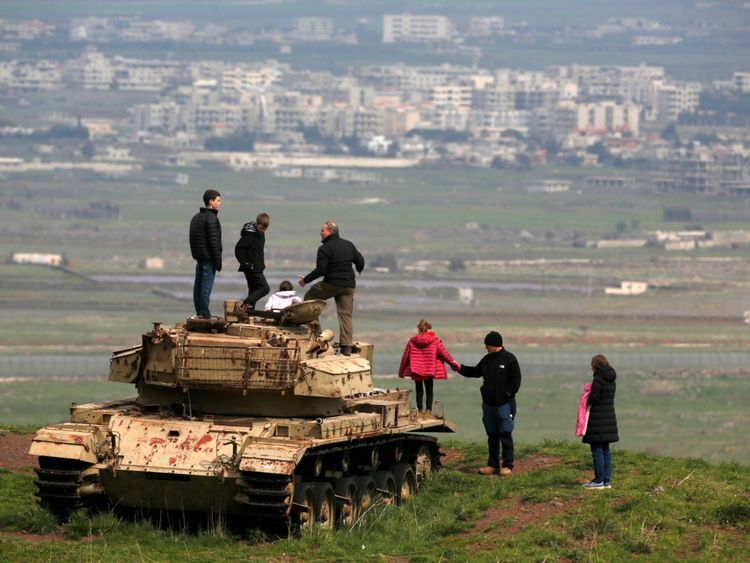 Last year, 151 nations voted in support of a UN Resolution condemning Israel’s occupation of the Golan Heights; the exceptions were Israel and the US. If Trump is allowed to get away with redrawing borders and facilitating regime change on a whim even as America’s democratic allies grumble on bended knee then all hail to the world’s self-appointed Supreme Leader whose word is law. It’s surely time for high-minded heads of state touting their democratic values and respect for the rule of law to grow a backbone.